NYJavaSIG, Enterprise Case Studies and a Health Check Tip! - 0006076: Configuration of <error-page> for 400 Bad Request not working: Shows "unavailable due to ***an internal error***"
Caucho Solutions Engineer, Sean Wiley, will be presenting on the topic of Microservices, Java EE, Java Web Profile, Agile and High Performing Webapps at the NYJavaSIG on October 11th. How will he manage to cover such a vast set of topics? With the Caucho Platform of course! Having been a leader in the field for 20 years, the Caucho platform has continued to evolve to meet the demands of the most demanding web applications in the field. Evolving from a simple servlet container to an entire load balancer, web server, app server, and more importantly web application platform, Caucho has maintained efficient & precise engineering as our mantra. Whether today’s developers are building fat JARs, skinny JARs, WARs, microservices or even the newly branded serverless components, the Caucho Platform supports successful deployments in these fields while spurring innovation. ​Recently a new tab "Case Studies & Presentations" has popped up on caucho.com. This is where we will feature use cases as Resin deployments continue to expand worldwide. Look for a new video to go up shortly detailing how one of our clients solved their hight availability needs with a Resin cluster. ​We are always looking for new material to detail our clients success with Resin. If you would like to be featured, please reach out to Alexandra at garmon@caucho.com and we'll include your story. New Partnership - Resin and ElasticBeam deliver high performance web apps and API's on demand! 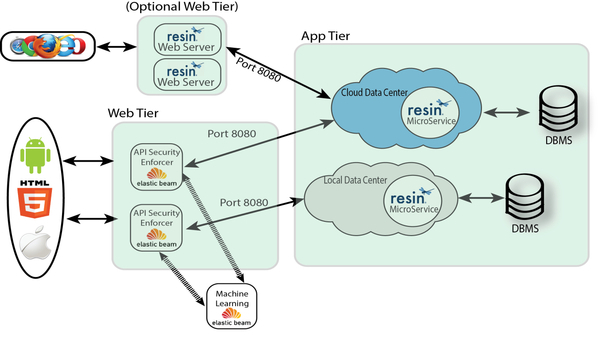 Resin delivers adaptive clustering, high throughput, and health monitoring for high availability. Elastic Beam API Behavioral Security software scales and secures access to API-based applications across Private and Hybrid Cloud data centers. Together, they offer a complete solution for delivering secure web applications at scale. As Caucho continues its global expansion, we collaborated with our Korean distributor, Xest Information Technologies, to present a high level overview of how three companies have leveraged the Caucho Platform within their architecture to simplify their development, increase their production, and significantly reduce their TCO with a unified Caucho architecture. Check out how some of Korea’s most successful companies have migrated away from other products including WebLogic and Jeus! Recently we have been helping our clients diagnose issues across their runtime environment spotting errors not related to Resin while using the Resin Health System. How is this possible you ask? With our anomaly detector of course! You can add health actions to be triggered based off the anomaly events firing of in your application to help spot network related, app related, or resource related problems your system may be struggling with. This AnomalyAnalyzer comes preconfigured in default Resin setups to send a health event notification to the system whenever the thread count deviates from the established baseline. This is all of course in part to get Resin running with 99.99%, when Resin runs standalone without maintenance not only is your job made easier, but ours as well! This entry was posted in Newsletter on September 6, 2017 by Sean Wiley.